A well-executed European Capital of Culture Year that provided tremendous cultural variety of the highest quality, excellent public attendance, positive total funding and a strong contribution to community development in general. Now that Umeå2014 has formally concluded the Capital of Culture project, Umeå can look back at a successful year of culture. There has been an impressive depth and breadth to the financing. 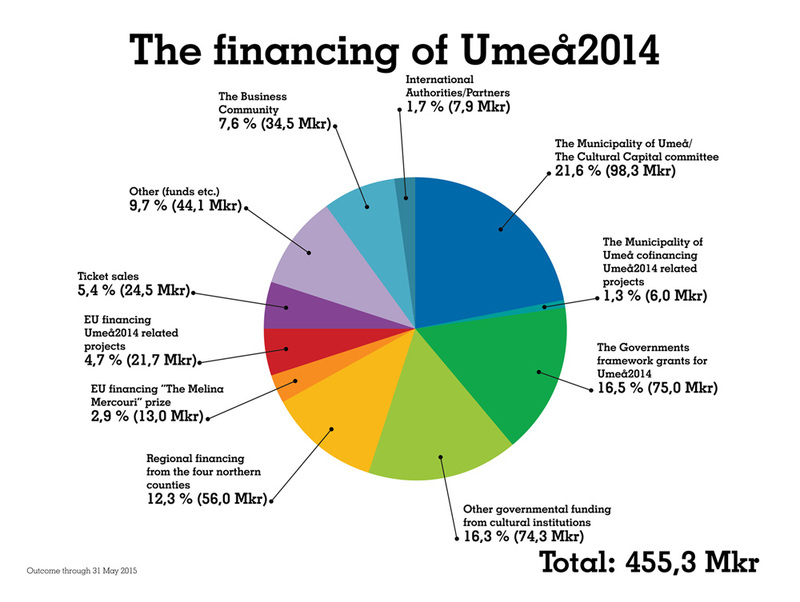 Umeå2014 received financing from the EU, the municipality of Umeå, businesses, international authorities, regional financing and others that resulted in a total of SEK 455.3 million. It should be added that the European Capital of Culture application reported a budget of SEK 410 million, which means that the financing objectives were exceeded by SEK 45.3 million. 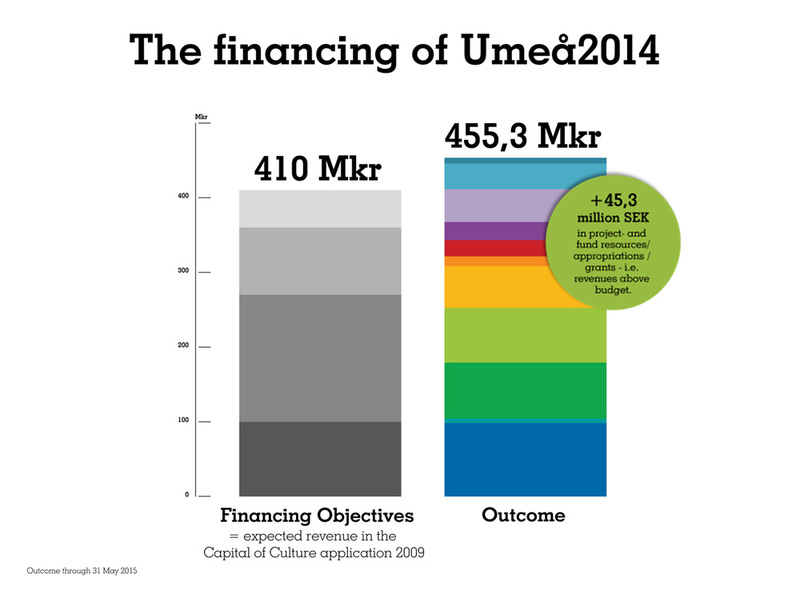 A major portion of the increased financing came from the organisation model and work methods used by Umeå2014, that was based on a networking organisation that encouraged and invited co-financing. “This shows that culture creates human development, community development and economic development. Everything exceeded expectations and for that we can thank all our co-creators. Culture is the bloodstream of society and gives us belief in the future!” says Marie-Louise Rönnmark, Chairwoman of European Capital of Culture and City Councillor in Umeå. Besides financing that is directly linked to the programme activities, the European Capital of Culture Year has affected other parts of society. For example, Umeå’s total investments in infrastructure linked to the European Capital of Culture Year during 2009 – 2014 totalled SEK 1.3 billion. 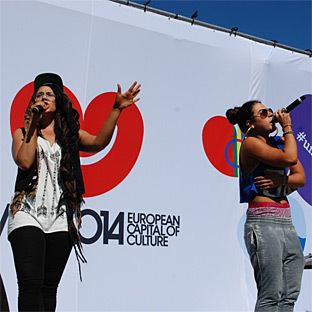 During the European Capital of Culture Year, a wide range of programs (1,054 items) ranging from smaller activities to major events were presented. This has affected both local and regional businesses, not just the cultural sector. Worthy of mention is that Västerbotten showed the greatest percentage increase in comparison to the rest of the country with respect to accommodation revenues. Västerbotten’s increase was 16.4 per cent. The project owners that were active during the European Capital of Culture Year have seen a clear financial improvement. Just under 60 per cent of the project owners experienced a high degree of financial change. The reason for this increase was not just Umeå2014, but also such things as sponsoring and increased ticket sales. A major portion of the project owners (90 per cent) have, to some degree integrated gender, accessibility and diversity into the project. Approximately half of the project owners reported that the project has had a positive affect on the environment and sustainability. 86 per cent of the project owners believe that it has strongly contributed to their organisation’s development. In PwC’s preliminary final report of the European Capital of Culture Year Umeå2014 presents evaluations on how Umeå’s strengths and development areas changed over time. The seven capitals; environmental and natural resources capital, social capital, intellectual capital, infrastructure capital, culture and experience capital, democracy and prosperity capital as well as information and communication technology (ICT) that constitute the basis for the evaluation, have all been strengthened over time. The social and environmental capital has had the strongest development. These years also had a positive affect on development in the education sector, development with regard to experience capital and infrastructural improvements. Riga was also a European Capital of Culture during 2014. Riga has approximately 6 times the population of Umeå. The results show that both European Capital of Culture cities reported an increased participation in cultural events, and that in many instances, Umeå’s figures nearly matched those of Riga’s and in some cases even exceeded them despite the fact that Riga is a bigger city. Over 800,000 attended Umeå2014 events during the European Capital of Culture Year and ticket sales for the major ticketing agents in Umeå increased by 39 per cent during 2014 compared to the years 2009 – 2013. “During the European Capital of Culture Year, we have been able to enjoy a rich cultural variety that paves the way for the future. The development we have seen raised the cultural level and it is great to be able to see it confirmed in black and white. We have even noted that the success has spread to other areas of community development in Umeå and the region,” says Fredrik Lindegren, Artistic Director Umeå2014 and Head of Cultural Affairs. The international interest has been great before and during the European Capital of Culture Year. Visibility in the media throughout Sweden and the world has surpassed 2 billion unique visitors. Primarily it is the cultural life that sparks interest and thus increases the desire to visit Umeå. Conservatively calculated, the PR value amounted to a total of SEK 380 million for the period of November 1, 2013 – January 31, 2015. Together with the rest of Europe, Umeå was given the opportunity to develop and share its cultural life with the whole of Sweden and the world. Associations, organisations and institutions created events that put Umeå on the map as a self-evident city of culture with a truly unique momentum and spirit. ”The show-windows of Umeå2014 were able to display the enormous creative forces that Umeå has, and has had for a long time, throughout the European Capital of Culture Year. The entire communicative process, from application to execution, was characterised by Umeå2014’s core values: co-creation, curiosity and passion. Other hallmarks were innovation, diversity, development, equality and sustainability,” says Elisabeth Lind, communications manager for Umeå2014. “Umeå today is not the same city as it was when we began working with the European Capital of Culture Year. Along the way, we have been enriched by countless experiences and drawn many valuable lessons. We see the importance of allowing culture to be part of all areas of society. We are extremely pleased with the Capital of Culture investment! We have moved boundaries and are now a more visible actor in Sweden, Europe and the world. Through excellent cooperation and active networking, we now have a good breeding ground for continued development, not just in Umeå but throughout the entire northern cell. This is just the beginning…” Marie-Louise Rönnmark says emphatically. ”It is now essential that we continue to develop and take advantage of the momentum and inspiration that we experienced during the project period. This holds true, regardless of whether we are talking about operative cultural projects or more strategic and methodological development. Two concrete examples of this are European Green Capital 2017, where Umeå again is one of four cities nominated to the finals, and Umeå’s upcoming 400th anniversary in 2022. Umeå’s cultural scene has done a fantastic job during the European Capital of Culture Year,” Fredrik Lindegren concludes.